These days, delivering an enhanced student experience is only one of the challenges that universities and colleges are facing. In this accompanying podcast, Helen Beetham discusses the importance of digital capabilities and wellbeing. A range of other issues including internationalisation, inclusion, developing online and work-based offers, big data, security and analytics all require staff with specialist skills. In addition to addressing these challenges, staff with digital expertise are the key to unlocking institutions' investments in IT infrastructure and systems. I‘ve had a busy few months leading on a project called framing staff digital capabilities as part of the Jisc building digital capabilities co-design challenge. With my colleague and fellow e-learning consultant Lou McGill, I have looked at the different frameworks, standards and specifications for describing what people do with digital technology. These range from generic information computer technology (ICT) frameworks, such as the new modular European Computer Driving Licence, to professional standards, such as the certified membership association of learning technology (CMALT) and the UK professional standards framework (PSF). The project has included a detailed consultation process with professional bodies and experts, and with providers across the higher education (HE) and further education (FE) landscape that are investing in the digital capabilities of their staff. A short review of upcoming changes in the technological and organisational landscape within FE and HE - to give universities and colleges a reference point when reflecting on the staff skills they will need to respond to these. One of the most exciting issues to emerge from the interviews I've undertaken has been a new area of interest: digital wellbeing. Wellbeing addresses some of the concerns raised by staff who find their working life saturated with digital technologies. These include stress and information overload, the changed quality of relationships, and work-life balance. In line with this is the responsibility staff take for the wellbeing of others (especially students) in digital settings. While these are organisation-wide issues, individuals are still responsible for promoting respectful behaviour online, promoting ensuring equality and inclusiveness, and checking the impact of digital technologies on human and natural environments. Meanwhile students express different but parallel concerns. Our digital student co-design work found that learners' fears range from exposure, to loss of face-to-face contact with teaching staff, as well as issues of distraction and concentration. Of course technologies can be used in ways that enhance wellbeing: to provide social support, to help learners reflect and understand their learning process better, and to break down barriers of understanding. 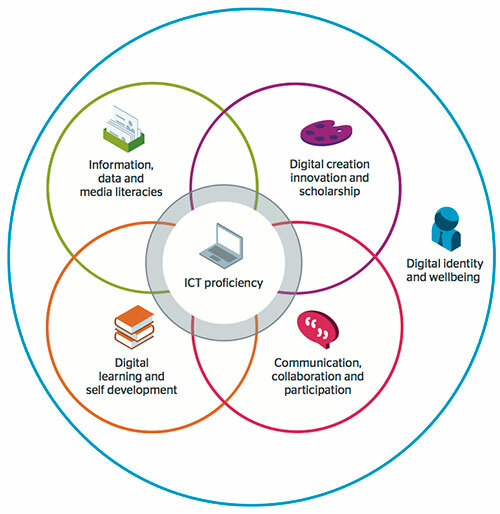 This is very much in the spirit of the 2009 project study learning literacies in a digital age, which looked at learners' capabilities in a holistic way and summarised them in a report called Thriving in the 21st century: Learning Literacies for the Digital Age. There is still time to comment and influence the final form of these outcomes and – more importantly – the ways they are applied in practice. You can comment directly via the digital capabilities blog post that summarises the outcomes to date. We are also working with a number of colleges and universities and with professional bodies to validate the framework and develop examples of it in use. We’re also taking the concept of digital wellbeing on the road to spread the message further and ensure it’s taken seriously. This aspect of the project has already excited a lot of interest when presented at conferences, including UCISA spotlight on digital capabilities and EdTech15, as well as a recent meeting of project stakeholders to plan our next steps. I have just gathered an armful of feedback from the Jisc learning and teaching experts' meeting in Birmingham, and you can check out the Twitter debate on digital wellbeing yesterday using #LTHEchat. So please, get in touch with your thoughts on the digital capabilities blog before the end of July or get in touch with Sarah Davies, head of change implementation support - education/student. Helen is co-leading the Jisc digital student study and compiling outcomes from the Jisc developing digital literacies programme. Helen has led on a number of influential reports and funded programmes, from learners' experiences of e-learning to e-portfolios, and from open content to curriculum design.